The Sikh Times - Biographies - Roger Ebert: "The Right Really Wants to Punish You For Having an Opinion"
Roger Ebert: "The Right Really Wants to Punish You For Having an Opinion"
Matthew Rothschild is the editor of The Progressive. 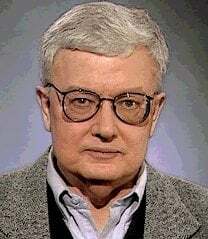 Roger Ebert was the first-ever recipient of a Pulitzer Prize for film criticism (in 1975) and is best known for his T.V. work opposite the late critic-colleague Gene Siskel on 'Siskel and Ebert' (they were formerly hosts of P.B.S. 's 'At the Movies' and Ebert now co-hosts the show with Richard Roeper). He is a film critic for the Chicago Sun Times and is the author of several books on cinema, including A Kiss Is Still A Kiss (1984), and has also written screenplays, most notably for Russ Meyer's cult classic, Beyond The Valley of the Dolls (1970). Matthew Rothschild: "Tell me what was your reaction to Michael Moore's acceptance speech at the Academy Awards." Roger Ebert: "I heard him give the same speech the day before at the Independent Spirit Awards, where he stood up straight, and looked the audience in the eye, and took his time. It got a good response, although that audience was more receptive than the academy. But I have a feeling an acting coach could have analyzed his performance at the Academy Awards and said he was prompting the Academy to dislike his speech because he hunkered over the microphone, and he talked too fast and defiantly, as if he was trying to get it out before he was stopped. His body language and his verbal language all kind of sent the wrong message. Nevertheless, I agree with what he said. I don't think Bush was legitimately elected President. But I was very offended as a reporter when Michael came directly back to the pressroom where I was, along with 300 or 400 other reporters, and lectured us, 'Now do your job. Don't report it was a divided house. Only five loud people were booing.' "
M.R. : "It didn't sound like only five people were booing." R.E. : "No, it wasn't five. I was just talking with Sean Welsh at the Wisconsin Film Festival, who directed Spellbound. He was one of the directors Michael had invited up on stage, and I asked him very carefully about that, and he said, 'No, it sounded about 50-50.' But Michael immediately went into this spin-control mode. In one interview, he said it sounded like the stagehands were yelling at him, and that the boos started before he had really gotten into his speech, and that they were amplified. And then he said a lot of the boos were people booing the booers. This is like we're in grassy knoll territory now. I think he would have been better off saying, 'Well, you know, the Academy wasn't ready for my opinion, and it was pretty divided: About half of the people booed me.' Which is what it sounded like to me." M.R. : "I was surprised by the amount and the volume of the boos. Why do you think there was such a divided house?" R.E. : "The Academy is paranoid about its image. I think they did not want America to feel that they subscribed to what they feared Michael Moore was going to say because he talked so quickly that they couldn't really assimilate what he was saying in time to do anything more than realize that he was going over the edge as far as they were concerned. I would propose to you that if Michael Moore had taken a deep breath, and looked straight at the audience, and said, 'I am a nonfiction filmmaker during a fictitious Presidency,' and stopped, I think he basically would have gotten a positive response to that. But his whole delivery was wrong. I think his delivery prompted the audience. They were not ready to assimilate that much that quickly. You know, they didn't boo anyone else, and there were several other anti-war speeches that were applauded." M.R. : "But they were much less explicit." M.R. : "I mean, 'Shame on Bush' is about as explicit as you can get." R.E. : "But by the time you got to that, the boos were already 30 seconds old." M.R. : "How do you think it played with the larger audience, the American public?" R.E. : "I think it gave ammunition to Michael Moore's enemies. I think it played into their hands." M.R. : "We had a long discussion about this the day after at The Progressive. Some of us, like me, were just so delighted to hear someone get up and say that out loud - to say we're defiant, we're not going to accept this man and this man's illegal war - that it gave us a real sense of positive energy." R.E. : "You know, they say be careful what you ask for because you're going to get it. On our 'Ebert & Roeper' program, we have an annual show where we pick the winners - who ought to win the Oscars, and then at the end of that show there's a segment where Roeper and I say what we would most like to see. So I wound up and said, 'I'd like to see Michael Moore get up there and let 'em have it with both barrels and really let loose and give them a real rabble-rousing speech.' I asked, basically, for that to happen. And then, when it happened, I don't think Michael Moore really sold it to that audience in a way that would have been more effective. So I'm in favor of people getting up there and saying it, but at the same time there is a way to communicate effectively so as to help your cause, and I don't think Michael found that." M.R. : "Adrien Brody from The Pianist, who won best actor, gave a speech about how horrible war was and then essentially saluted his friend who is over there and wished the best for him. Brody got a lot of praise for his nuanced speech. On the other hand, I was watching with my sixteen-year-old son, who is just kind of awakening to progressive politics, and he said, 'Why was that guy so ambiguous?' So I wonder whether a more explicit statement wasn't in order." R.E. : "You have to remember that the Oscars came on a day of reversals. Americans were taken prisoner of war. We had some casualties. We had some lost soldiers, and some helicopter crashes, and things were going badly. If the Oscars had been held three days earlier or a week later, everything might have been different. But Adrien Brody found the right note for that moment. I think you can say almost anything if you find the right way to say it." M.R. : "What do you make of the criticism of Hollywood celebrities for speaking out against the war - the Sean Penns, the Susan Sarandons?" R.E. : "It's just ignorant; it's just ignorant." M.R. : "Why do you say that?" R.E. : "I begin to feel like I was in the last generation of Americans who took a civics class. I begin to feel like most Americans don't understand the First Amendment, don't understand the idea of freedom of speech, and don't understand that it's the responsibility of the citizen to speak out. If Hollywood stars speak out, so do all sorts of other people. Now Hollywood stars can get a better hearing. Oddly enough, the people who mostly seem to hear them are the right wing, so that Fox News can put on its ticker tape in Times Square a vile attack on Michael Moore, and Susan Sarandon is a punchline. These are people who are responsible and are saying what they believe. And there are people on the other side who also speak out, and it's the way our country works. You know, if you're good enough to be the best actor of your generation, which is probably what Sean Penn is, you're probably not dumb." M.R. : "When the Susan Sarandons and Sean Penns speak out, they do so at some risk to their career options, don't they?" R.E. : "There's an interesting pattern going on. When I write a political column for the Chicago Sun-Times, when liberals disagree with me, they send in long, logical e-mails explaining all my errors. I hardly ever get well-reasoned articles from the right. People just tell me to shut up. That's the message: 'Shut up. Don't write anymore about this. Who do you think you are?' "
M.R. : "It's the Dixie Chicks impulse. One of the members of the group said she was ashamed to be from Texas where the President is from. And so, in what I consider a brownshirt tactic, some rightwing D.J.s organized gatherings where people literally stomped on Dixie Chick albums." R.E. : "It wasn't just some rightwing D.J.s. The New York Times reported that it was also organized by a radio conglomerate that had received a lot of favors from the Bush Administration in deregulation. So that was not a spontaneous outpouring. It's a shame. It's a shame. The right really wants to punish you for having an opinion. And I think both the left and the right should celebrate people who have different opinions, and disagree with them, and argue with them, and differ with them, but don't just try to shut them up. The right really dominates radio, and it's amazing how much energy the right spends telling us that the press is slanted to the left when it really isn't. They want to shut other people up. They really don't understand the First Amendment." M.R. : "You yourself generated some controversy recently when you said Bush acts as though God is his football coach and is sending in plays from the sidelines." R.E. : "I said God doesn't send in plays from the sidelines. [O]ddly enough the mail on that one was about 10-to-1 in favor . . . It was about theology. You know, the Pope sent an emissary to Bush to say God does not want this war . . . Catholic theology believes that God gave man free will, and you can't give somebody free will and then send in a play from the sidelines. I think that's what I said. Catholic theology also accounts for the fact that there's evil in the world. . . . I'm saying this not as a Catholic but as a student of Catholic theology. The Bush theory, of course, is that he has a personal dialogue with God: God talks to Bush, Bush talks to God. And Bush gets God's message, and Bush really believes that God's on his side. The problem with that is Bush then can't change his mind because God isn't going to change his mind. And so what we have here really is a rather alarming situation where religion in the White House has crossed the line between church and state." M.R. : "And there's no arguing with someone who can just bring out the God card." R.E. : "To watch him on television, he is just so sure, so sure. His certainty doesn't come from political or military realities; it comes from apparently on high." M.R. : "With the hostility about free speech that we were talking about a little while ago, do you think we're entering into a New McCarthyism period?" R.E. : "I don't know. I don't know that anyone is going to stand up in the Senate with a list, although there is, of course, a website with all the traitors listed on it. I mean, anyone can open up a website. The web is wonderful that way. I'm kind of glad the web is sort of totally anarchic. That's fine with me. I just feel that essentially the country is in the grip of some very bad information. I think a lot of working class people don't understand that their money is being stolen. I saw an interesting article that said 10 percent of the American public would put themselves in the top 1 percent in income." M.R. : "This is why Americans favor the repeal of the estate tax." R.E. : "Yeah, they all think they're going to leave a big estate, and they love Bush's theories because they all think they're going to get rich someday. But the fact is, most people are not going to be rich someday. And we've had a concerted policy of taking money away from the poor and giving it to the rich wholesale, and at the same time, we have the runaway corporations, and the greed. Look at [Richard] Perle's resignation; look what's really behind that. I feel ordinary people really should be angry. Yet a lot of them seem to be voting conservative and thinking that the conservatives represent them. And they don't." M.R. : "Why is that? You deal with people's perceptions in the movies and in your op-ed columns. Why do they have this odd perception?" R.E. : "I think most people are more susceptible to prejudice than to reason. And the parrots of talk radio are just sending out the same stuff. When I look at my e-mails, I see the same Limbaugh rhetoric; apparently, people don't have any ideas of their own. And there's just this drumroll of anti-progressive thought." M.R. : "If you were putting on a progressive film festival, what movies would you show?" R.E. : "It's a good question, because a movie isn't good or bad based on its politics. It's usually good or bad for other reasons, though you might agree or disagree with its politics." M.R. : "What would be some good movies that also had progressive politics?" R.E. : "Well, I like Dead Man Walking. That's a very good movie. There's this new Brazilian movie City of God about poverty and crime in the slums of Rio. Adrien Brody did an interesting film called Bread and Roses directed by Ken Loach. Brody plays a union organizer who is trying to organize the hotel workers of Los Angeles. There's a real movement under way against unionism." M.R. : "There are not a lot of movies out there on class, per se. I remember seeing a movie oddly starring Richard Pryor called Blue Collar about automakers. And of course there's Norma Rae. What about other movies about class?" R.E. : "Class is often invisible in America in the movies, and usually not the subject of the film. I just saw a wonderful film called Better Luck Tomorrow by Justin Lin about rich, Asian-American kids in Orange County and how they go astray and how they get into drugs and then into crime. And I saw another movie by Larry Clark called Bully about poor white kids who get into drugs and are led astray and get into crime. And these two movies are instructive because neither one of them seems to be totally aware of the class issue. One is about a lower economic group, the other is about a higher economic group, and both are totally involved with story and character and personal relationships. We don't have a lot of class-conscious filmmaking." M.R. : "One that you cite in this new book of yours, The Great Movies, is Hoop Dreams. That does have a sense both of race and class." R.E. : "There's a chilling moment in there. These two poor black kids from the inner city of Chicago are recruited by a rich suburban high school to play basketball for them. One of the kids doesn't really work out very well. So he wants to transfer to an inner-city school which has a good basketball team. But he can't get his transcript until his parents pay his back-due school fees, which would have been covered by a scholarship if he had been a better basketball player. The injustice there is so dramatic. That's a scene on camera that is just chilling. These kids were brought an hour's train ride every day from where they lived in order to play basketball. They're in high school. And when a kid doesn't pan out, it's heartless, it's heartless." M.R. : "The mother in that movie is so sympathetic. She's trying to make ends meet, but she can't make ends meet. And the lights get shut off; the heating gets shut off." R.E. : "She turns to the camera and says, 'I bet you're wondering how I manage to live on $265 a month, aren't you?' . . . 'I'll sit down and tell you how you do it: You kind of depend on a network of family and friends, and people kind of help each other out.' The filmmakers eventually, suddenly, cut to a graduation ceremony, and that mother has been taking training to become a nurse's aide, and she graduates. We didn't know that, and the camera pans around to the auditorium where the ceremony is taking place, and there were maybe a dozen people there. Gene Siskel, in reviewing that film, said, 'You know, the auditoriums are filled when their sons are playing basketball, but they're empty at a moment like this.' And that's when the audience should be cheering, because this woman, despite her poverty and her situation, has gone to school, learned a trade, and now she has a diploma. That was kind of a moving moment. That film is very much about fighting against poverty." M.R. : "One other movie that deals with race is Do the Right Thing. You were a big proponent of that film. Why?" R.E. : "[P]eople have gotten the idea that Spike Lee is angry. He's not angry at all. If you look at Do the Right Thing, it's one of the most even-handed, fair-handed, open-minded films. . . . [I]t doesn't demonize anyone. On the other hand, I think we're moving now into a time in America where race is becoming less obviously important as the subject of films that have people of various races in them. . . . You know, it used to be if there was a black character in the movie, the movie was about this character being black: Oh, here's Sidney Poitier, he's going to help the nuns change their tire. Now, that's not the case anymore. . . . I think we have to get beyond the idea that we have to categorize people. We can now have action movies with two stars where one might be African American and one might be Asian American. One of them doesn't have to be white, and the other one doesn't have to be the ethnic sidekick. We're way over that. . . . it's happening in society, too." M.R. : "Some people say the last prejudice in Hollywood is the depictions of Arab Americans or Arabs or Muslims. Would you agree with that?" R.E. : "Yes, I've written about the demonizing of Arabs, and at my Overlooked Film Festival at the University of Illinois I showed a film called Maryam, which is about an Arab American family and how the attitudes in the community toward them change during the Iranian hostage crisis. I think once you get over here, we're all in the same boat. However, what's interesting is it's now going on 60 years since the end of World War II, and the Nazis are still the only dependable villains because nobody else can be demonized now because we're so politically correct. I like it when people are just bad because they're bad. And it doesn't have to do with the bad Arabs, or the bad this, or the bad that." M.R. : "Who are the moviemakers now that you look to who can have this sort of transformative effect?" R.E. : "Well, not all of them are still alive. I wish more people knew about the Japanese director Ozu, who has insights into human nature that are just astonishing. Among current directors I think Martin Scorsese and Robert Altman are the two best active directors right now. I'm amazed by Neil LaBute, who has come along lately in the last five or six years with plays and movies that are quite devastating. In the Company of Men and Your Friends and Neighbors, which are really perceptive and angry about the way that corporate culture and male dominance work and how people can get so blinded by materialism that they don't even care whether they have any values or not." M.R. : "In the introduction to your book The Great Movies, you make an extravagant claim: 'Of all the arts, movies are the most powerful aid to empathy, and good ones make us into better people.' The second half of that may be easier to defend. I'm wondering about the first half, 'Of all the arts.' "
R.E. : "Movies absorb our attention more completely . . . If a movie is really working, you forget for two hours your Social Security number and where your car is parked. You are having a vicarious experience. You are identifying, in one way or another, with the people on the screen. Since we're all locked inside ourselves, and since we're given the hand we were dealt when we were born, it's a way to empathize: to try to understand what it would be like to live in a different time, to be a member of a different group, and that's important. It makes us more broad-minded. A lot of people just go to movies that feed into their preexisting and not so noble needs and desires: They just go to action pictures, and things like that. But if you go to foreign films . . . documentaries . . . independent films . . . good films, you will become a better person because you will understand human nature better. Movies record human nature in a better way than any other art form, that's for sure."